Birth Date / Birthday / Age 29th March 1980. As of 2019, her age is around 39 years. Megha Ghadge, a talented dancer was born in Pune, but brought up in Mumbai. She is also a lavani dance teacher and conducts classes on folk dance called as Megh Malhaar at Andheri in Mumbai. 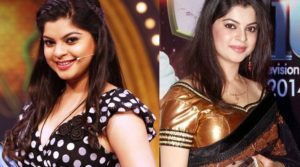 She is a skilled dancer and has performed in a few Marathi TV shows and films such as Pachadlela (2004), Maherchi Maaya (2007) and Chal Dhar Pakad (2010). She regularly performs in various dance related shows, performances and dahi handi events. Wedding / Marriage / Husband / Boyfriend Currently Not Married. No additional information about her family or parents available with us. Height and Weight Her Height is 5 ft 3 inches. Just beautiful meghna mam… i like u so much. Hiiii megha mam…..I’m a big fan of u .
I feel very proud with u..nd ur skin colour ….because I’m also dark in skin colour. …nd I’m also a dancer ….